Take a full day excursion from Tokyo to the Mt Fuji area, first traveling by coach up the slopes of the mountain to 5th station, famous for its great views. Then relax at the base of Mt Fuji in Yamanakako village and indulge in a rejuvenating soak at a hot springs resort. Finish your day with a shopping trip at Gotemba Premium Outlets and find brand name goods at discount prices. Meet at a designated location in Shinjuku, Tokyo and departure on a comfortable coach to Mt Fuji. You’ll travel 60 miles (100 km) to 5th station, a viewing area on the slopes of Mt Fuji. Check out the incredible views from observation points around the area. As you stroll and snap photos, your expert guide will share stories of the revered mountain, which has inspired many poems, paintings and pilgrims over the centuries. More than 200,000 climbers each year begin their ascent from 5th station to the mountaintop, Japan’s highest peak at 12,389 feet (3,776 meters). As it can be chilly due to the elevation, be sure to bring a jacket. Warm up at a nearby restaurant where you'll enjoy a Japanese lunch served on a plate made of stone from Mt Fuji’s slopes! If you select lunch option, a Japanese-style lunch will be served. Otherwise, you'll have some time exploring lunch options on your own expense. After lunch, you’ll return to the base of the mountain where Lake Yamanakako glistens next to the village of Yamanakako. Here you’ll take a mini-retreat at the onsen at Beni-Fuji-no-Yu. 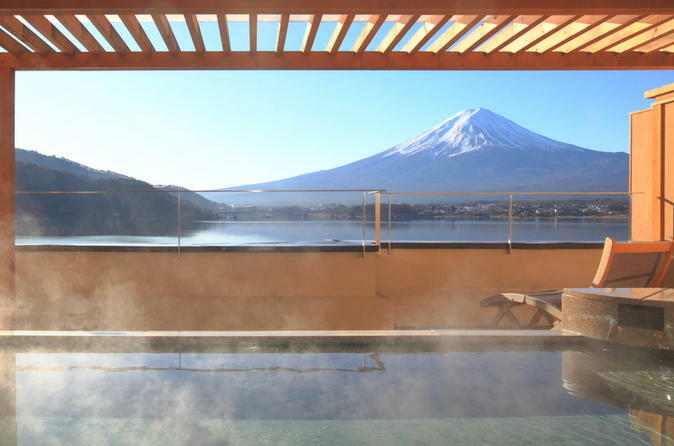 Relax in the outdoor hot pools set among lovely gardens with excellent views of the Mt Fuji. You can also explore the saunas, steam rooms, and waterfall showers on the grounds. After refreshing yourself at the onsen, head to the nearby Gotemba Premium Outlets and enjoy 2 hours of shopping. With 210 shops and international brands like Dior, Ray-Ban and Yves Saint Laurent, you’ll have plenty of options for your browsing pleasure. Have time to stroll around the tasteful shopping center and catch yet another glimpse of Mt Fuji in the distance. At the end of the day, your coach will return you to the Shinjuku district of Tokyo.